Serco runs Orkney and Shetland ferry services under the Northlink brand - and is competing for the new contract to provide Clyde and Hebrides ferry services too. The director of private firm Serco’s bid to run the Clyde and Hebrides ferry network says islanders should be “reassured” by the company’s performance elsewhere. Jonathan Riley said the firm would be holding public events around the area to enable communities to find out more about the company and its record in providing public transport in other areas. The firm currently operates lifeline ferry services to Orkney and Shetland under the Northlink brand, and earlier this year took over the running of overnight sleeper trains between Scotland and London. 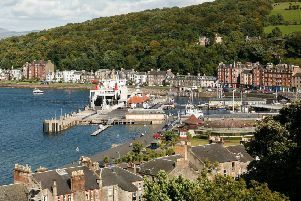 Serco is bidding against the publicly-owned CalMac Ferries Ltd for the eight-year Clyde and Hebrides Ferry Service (CHFS) contract, which will begin on October 1, 2016. * More from our conversation with Mr Riley in the October 16 issue of The Buteman - on sale now.